Astonishing Argentina! Sweeping from central South America to Patagonia, it is South America’s second largest country, and the world’s eighth largest. Its wide tracts of fertile land and richly varied terrain mean an enormous diversity of climates and locales. Its natural wealth and well-educated workforce have contributed to its rise as an Upper-Middle Income country. However, as in much of Latin America, there is another tragic story of missed opportunities: endemic corruption, military interventions, and the vagaries of the world’s financial markets have repeatedly brought socio-economic disaster to Argentina. 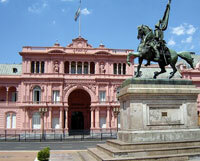 Argentina is one of the world’s leading agricultural producers. The flat, fertile plateau of the Pampas region is central to the Argentine economy. Argentine beef is prized, and fine wine from the Mendoza region has gained international recognition. 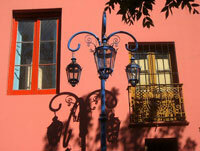 Argentina is also rich in gold, silver, copper, and other important minerals. Travellers flock to Argentina’s bustling capital, Buenos Aires, with its European sophistication, rich culture and night-life—all at a cost of living considerably lower than in many Western countries. 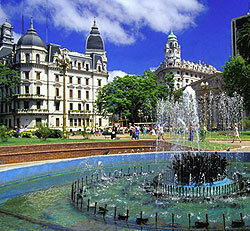 They go to the country’s vibrant second capital, Rosario, to Mar del Plata and its beaches. They are drawn by the roaring Iguazu Falls in Misiones, the quaint, colonial air of Salta, the indigenous cultures in Jujuy, the festive atmosphere of Córdoba, the bacchanalian delights of Mendoza's famed wineries, the ski slopes and lakes near Bariloche, the beaches of Pinamar, and the icy majesty of the Perito Moreno Glacier and Tierra del Fuego. 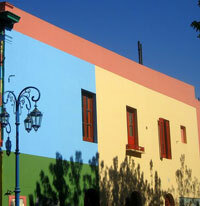 Argentina’s tourism industry is greatly helped by the country’s reputation as an affordable and relatively safe, yet exciting country. Since the early 2000s, Argentina has become a favourite holiday destination for Westerners drawn by its eclectic mix of natural landscapes and cosmopolitan urban areas. Just as Argentina entranced the world through the tango, many people the world over have been enchanted by the country’s unique cultural flavour. Its promising business opportunities and interesting locales brimming with activity have persuaded many expatriates to settle here. Europeans first arrived in Argentina in 1502, founding a colony in what would later be Buenos Aires in 1580, as part of the Viceroyalty of Peru. In 1776 the Viceroyalty of the Río de la Plata was created. After Napoleon invaded Spain, Buenos Aires formed a junta and invited the other provinces to join it. The federalist dictator Juan Manuel de Rosas rose to power and ruled with the aid of a private army, La Mazorca. European immigration and investment in the second half of the 19th century transformed the country. Modern agriculture was introduced to Argentina—a successful move that led to the country’s emerging as one of the world’s 10 richest countries in the early 20th century, thanks to its agricultural exports. For years until the end of World War II, Argentina’s fortunes shifted as the military and popular forces struggled for power, and political parties and their differing economic policies took turns running the country. After a post-war coup, Juan Perón seized power in 1946, and began and an authoritarian-populist, pro-poor presidency. Perón's wife, Eva Perón ("Evita") was the driving force behind Perón's success among the working class. Throughout Perón's first and second term, his economists encouraged accelerated industrial and urban development. Following Evita's death in 1952 at age 33, Perón foolishly became involved in struggles with the Catholic Church. He lost many capable advisers, and his personal patronage got out of hand. The army took advantage and a violent coup deposed him in 1955. He fled into exile, eventually living in Spain. In the years that followed, political violence escalated. In 1973 Perón returned, won the elections, and took office once more. When he died in July 1974, he was succeeded by his third wife Isabel. Mayhem followed as the right battled the left, and in March 1976 there was a military coup. The military’s National Reorganization Process began a brutal “Dirty War” by which thousands of dissidents "disappeared". The Argentine secret police cooperated other South American intelligence agencies and with the CIA in Operation Condor to kill leftists and oppositionists. The dictatorship’s free-market policies paradoxically brought a sharp fall in living standards and record foreign debt. The peso collapsed, there was unprecedented corruption, and the country's defeat in the Falklands War caused the regime to collapse, leading to free elections in 1983. President Raúl Alfonsín established civilian control of the armed forces, and consolidated democratic institutions. The previous regime's foreign debt, however, was heavy, and in 1989 there followed a currency crisis that resulted in Alfonsin leaving office. When Carlos Menem came to power, he pegged the Argentinian peso to the dollar and adopted free-market policies. These reforms contributed to significant growth through the 1990s; but the peso's fixed value required an increase in foreign debt. In 1999, the accumulating problems and reports of corruption led to Menem’s departure. In 2002 Argentina defaulted on its international debt, and the peso’s U.S. dollar peg was abandoned. By late 2002 unemployment was 25%. In May 2003 Néstor Kirchner, a social democratic Peronist, was elected president. He restructured Argentina’s defaulted debt, paid off IMF debt, renegotiated contracts with utilities and nationalized some previously privatized enterprises. The government was also somewhat lucky, as the country benefiting from hugely from the devalued exchange rate. Argentina has since been enjoying economic growth. In 2007, Kirchner’s wife Cristina Fernández de Kirchner became the first woman elected President of Argentina. The government’s weak spot has been over-spending, leading to double-digit inflation. In addition, the global financial crisis has since prompted Mrs. Kirchner to step up her husband's policy of state intervention in troubled sectors of the economy.